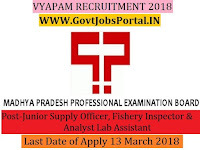 Madhya Pradesh Professional Examination Board is going to recruit fresher candidates in India for Junior Supply Officer, Fishery Inspector & Analyst Lab Assistant Posts. So, those candidates who are willing to work with this organization they May apply for this post. Last Date of Apply 13-March-2018. Total numbers of vacancies are 219 Posts. Only those candidates are eligible who have passed Graduate with Physics as a one Subject OR Degree in Engineering & Degree in Biology or Fishery Science. Indian citizen having age in between 18 to 40 years can apply for this Madhya Pradesh Professional Examination Board Recruitment 2018. Educational Criteria: Only those candidates are eligible who have passed Graduate with Physics as a one Subject OR Degree in Engineering & Degree in Biology or Fishery Science. 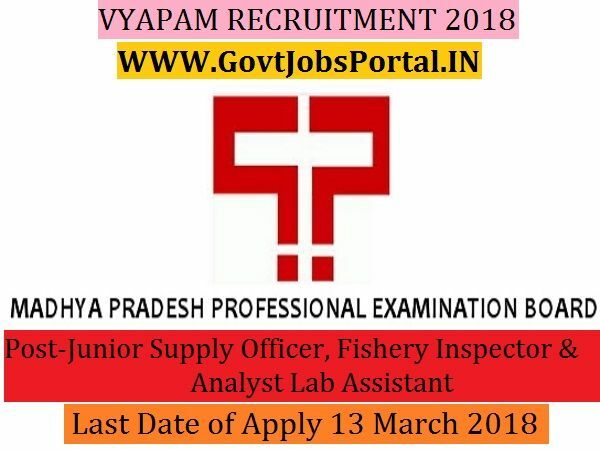 What is the VYAPAM Selection Process job?